River City phase 3 sales are currently underway. 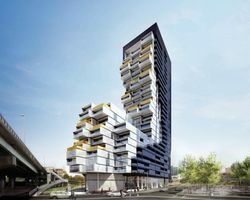 Standing at 29 storeys RC3 will have stunning architecture, and suites will have a modern loft-like design. Located in Toronto's Corktown District, convenience is key. Units range in size from a one bedroom at 508 sq ft, to the largest penthouse at 2,083 sq ft.
Pricing ranges from $299,900 to $1,395,000. Parking is $39,000 and lockers are $4,500 extra. Contact me for more information, or if you want me to set up an appointment with the builder.